I had a long day yesterday and by the time I got home, it was late and I have my 5K today, so I only ran 4 miles. They were 4 really good miles. The heat didn’t bother me as much and I just felt good running. Today is the Shake and Bake 5K. TJ, RS and I are going to eat breakfast at Steak n Shake and then head out to meet Neill (@BigBigGeek) at the race. 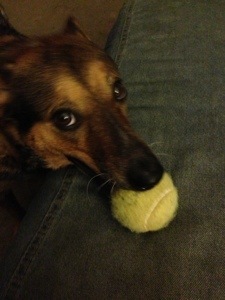 Anyway, I’m just hangin’ with “The Dog” and playing ball as I wait to head out. This entry was posted in 5K race prep, dog, Race day, Running and tagged 5K, RS, running, TJ. Bookmark the permalink. Try a little ground ginger in your beet root juice to cut the “earthy” taste. One of the smoothie recipes I used suggest that. (My friend still said it still tasted a little like dirt to her, but I thought it helped.) Hope your 5K goes great! Thanks!!! I appreciate the tip. About to warm up for the race. I have to say, I love all the pictures of “The Dog.” She’s so cute! Thanks! She is a great dog!!! I’m enjoying following your progress. Keep up the great work! I really appreciate it. Thanks! That means a lot! Have fun at the Shake and Bake! You’re such a huge inspiration! It was great fun. Thanks. And thanks for your comment. You are very inspirational also!!! Running 4 miles the day before a 5K is pretty serious. If I was really hoping to do my best I probably wouldn’t run the day before. I am also impressed with the Steak and Shake breakfast before the race 🙂 I don’t know if I could handle that 🙂 After the race that sounds great! Congrats on a very cool journey for this blog and I wish you tremendous success. I am training for my first 24 hour race in Phoenix in December and I do know what you mean when you say that “the training isn’t as fun as you thought it would be”. There are days when it is brutal and the last thing you really want to be doing. I totally get that. But when you cross that finish line.. it makes it all worth it. Found your site on the Friday linkup and I look forward to delving further into your site! Thanks! Yes, if I want to do my best in a race, I never run the day before. My son TJ likes running the day before to keep his body moving, but I run best after my rest day. That said, I had been sick this week and taken 2 days off and shortened 2 other days, so I figured I’d run Friday and hope for the best Saturday. I’m about to post my results from the race; no PR, but still did pretty good. Wow, 24 hour race. I am impressed. Just training and signing up for one would be a huge accomplishment! Congratulations. I’ll check out your blog also!